I found it very difficult to choose a recipe to try from Peggy Porschen’s book “Boutique Baking“, as each one looks and sounds just delicious. There will, of course, be more than one tried, tasted, photographed and posted! 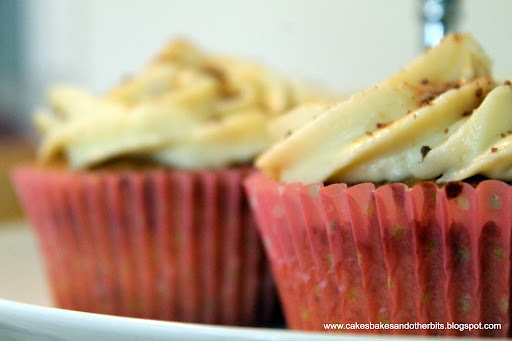 However, after thinking about making a Banoffee pie, I realised I had all the ingredients for Peggy’s Banoffee Cupcakes. There are a few stages to making these, and seeing as how it was a special occasion, hosting a Sunday Tea for my one of my nieces, who is also my God-Daughter, it was certainly worth the effort. However, time contraints did not allow for making the flower decorations as per the book. The recipe is for 24 cupcakes, but is easily halved. I only wanted to make 12, so here’s how I did it. Cream the butter, sugar, salt and vanilla seeds (if using) until pale and fluffy. Beat the eggs in a seperate bowl and add to the butter & sugar mixture, beating between each addition. If it begins to curdle, add a little flour, and this will bring it back. Sift in the remaining flour, fold through, add the chocolate, and fold this in also. 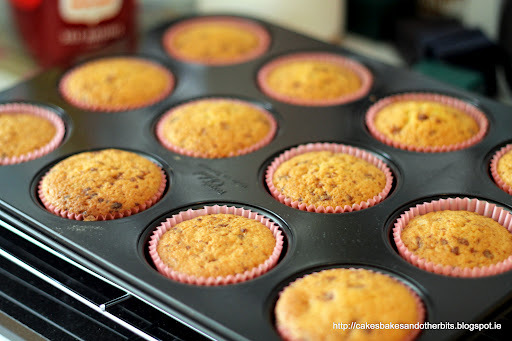 Fill each cupcake case two-thirds full, and bake for 12 – 15 minutes. Place 75ml water and 75g caster and a scraped vanilla pod (I used a teaspoon of Vanilla Extract) in a saucepan, bring to the boil, and simmer until the sugar has dissolved. Set this aside to cool. 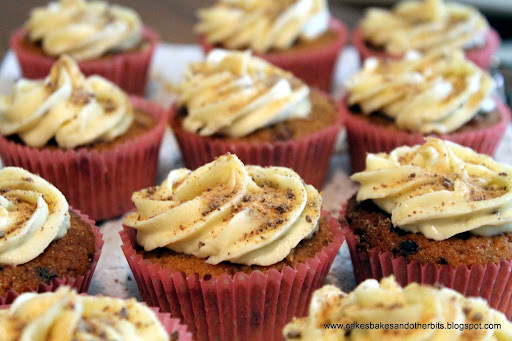 When the cupcakes are cooked, let them sit in the baking tray for about 10 minutes, and while still warm, paint the top of each one with the sugar syrup. Once completely cool, wrap in cling film and chill in the fridge for about an hour. Chilling the cakes makes them more firm, and easier to work with. 100g Dulce de Leche – if you can’t find the ready-made caramel, boil a can of sweetened condensed milk, submerged in water for 3 hours. Mash in half a ripe banana. Using a melon baller, scoop out a piece from the top of each cake. Carefully spoon some of the filling into each hole. This is done (in the book) by putting the Dulche de Leche in a piping bag, but if you are doing this, be aware that it has a fairly fluid consistency. At this point, I covered the cakes loosely with cling-film and put them in the fridge overnight. Beat the cream cheese until smooth. In separate bowl, beat the butter and icing sugar together until fully combined. Add the cream cheese, a little at a time and combine. Lastly, add the mashed banana, stir through, cover with cling film, and place in the fridge until set. I left it overnight, as I didn’t want to do the frosting until the day of eating. 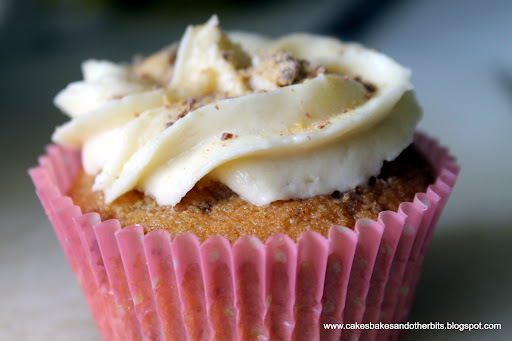 For piping the frosting on to the cakes, I used a 1M tip. The recipe uses a plain tip. For the flower decorations, there are step-by-step instructions in the book on how to make these. I blitzed up a Honeycomb chocolate bar into an almost powder consistancy, and sprinkled this over the top. An idea, admittedly borrowed from Donal Skehan’s topping for his Banoffee Pie! The cakes were very well received, with lots of “wow, these taste great”, which is always pleasing! These cakes are very rich and moreish, but the effort really does pay off in the taste.